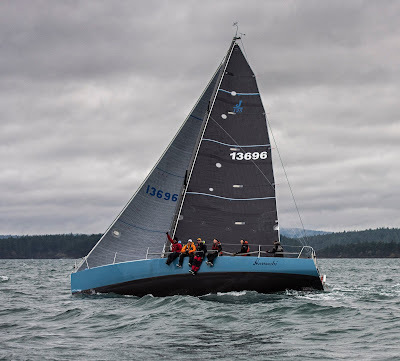 117 boats are signed up for the 2018 running of everyone’s favorite welcome to winter race – Round the County, hosted by the Orcas island Yacht Club and the Friday Harbor Sailing club. 117 boats and 25% of em’ are J Boats! Every single class in the weekend regatta has a J boat in it – well all of them but the pickle-fork class. Class 5 has two of the classic J performance cruisers, the J/30. Jim Bottles Celebration & Theo Singelis’ Taku among the fastest rated boats in their class. They have their work cut out for them going up against a gaggle of Santa snooze 27’s and the worlds fastest Catalina 36 but if the conditions are right I’d expect bottles of celebration on Jim’s boat. Class 4 has one singular J Boat, the J/29 Beer & Now owned by Pat Denny. As we all know if they leave early enough to make the starting gun the black boat always has a chance to do well but their up against some amazing sailors on some amazingly diverse boats – everything from a 100+ year old rocket ship of a schooner to some amazing dueling Davidson 29’s and the always fast Farr 1020. Tough to call in Class 4. Class 3 has the plethora of J Boats, four J/105’s, a J/40, a J/33 and a J/88. Again it’ll all depend on what conditions show up for each race day but I’d expect to see the J/105 Dulcinea and the J/88 Bon Bini on the podium after day 2. Class 2 again has a good group of J Boats with one J/40 and 4 of the venerable classic J/35’s. Going up against some amazingly well sailed Beneteau 36.7’s and a consistently well sailed 40’er the J/35’s have a tough challenge on their hands. Class 1, whoa, class one has 10 J Boats, ten classy performance cruisers carrying full interiors all the way around the course against Flying Tigers & Farr 30’s along with some other big performance cruisers. This could be anyone’s year. Six J/109’s and four J/120’s up against some great boats and sailors. Will we see the Brunius Bandits and the husband and wife Wolfe’s on the podium or maybe the wily Burnell or the Father/Son Fraser’s eclipsing the fleet. If it’s mostly upwind and waves I’d expect to see the 120’s shine but if it’s shifty and smooth the 109’s may have a chance against the stripped out ultra-lights. Looking forward to seeing how this shakes out. Class zero goes all the way from the slowest rated boat, the J/111 Recon, to the beautiful J/122 Grace to the fast boat in the fleet, the amazing performance cruiser that is the J/160 Jam. Like class 1 the fleet goes from stripped out ultra-lights to water ballasted to gold medalist sailors but if the conditions are shifty, as the slow boat in the class, my money’s on the J/111 – they’ll have the advantage of seeing where not to go. Otherwise, in this class, anyone can be atop that podium if the conditions favor their set up and navigational prowess. ORC class, a J/145 and a J/125 going up against some amazingly advanced designs along with 3 TP52’s and an RP55. History has shown the TP52’s doing well – is it the rating system, is it the quality of sailor, who knows, but what I have seen is that the owners of the yellow tail 125 have shown they have what it takes to make that boat perform and if the conditions are right the little boat that could may end up on top. Consistent breeze waterline race, forget it, the 145 might have a chance but those modern stripped out racing machines are amazing. Sat E wind 5 to 15 kt becoming NE in the afternoon. Wind waves 2 ft or less. Sun N wind to 10 kt. Wind waves 1 ft or less. Light shifty conditions Saturday and maybe something solid on Sunday, but not windy. Currents don’t look to be too strong compared to previous years but I’d expect it to make a difference on Saturday. I’d expect ORC, 0 & 1 to make the full course but 2 through 5 might only make the halfway before Haro starts ebbing. Sunday the currents line up well with the wind forecast. With this info my guess is the J/109’s and J/120’s will end up high in the overall PHRF list and they’ll do it in comfort and style. Good luck everyone, have fun, and keep those heaters running if you’re carrying it anyway. Might as well right…your on a performance cruiser, do it in style. Learn everything you need to know about the race here.